UMERKOT: Mai Dhai Manganiyar, a folk star from the desert of Thar, will be the first voice to perform in United States of America and represent Pakistan at international music festivals in March. Mai Dhai, 60, from a poor Manganiyar community of musicians, is a huge crowd puller when performing on stage with her face covered in a traditional veil. She is a part of the Pakistani troupe participating in the largest music festivals organized by South By South West festival (SxSW) of Austin, Texas in US. Mai Dhai first appeared on stage in 2002 at Umerkot and received huge applause for her melodious singing which was similar to legendary Mai Bhagi, another Manganiyari female from Tharparkar known as ‘Koyel’ (nightingale) of Thar. Mai Dhai started singing at the age of 7. About her late appearance on stage, she told News Lens Pakistan that her husband was against women singing in the company of other men. A local politician Syed Sardar Shah convinced her husband to let her sing in public condition being the customary veil. Thar Desert, stretching between Pakistan and India is known for poverty, droughts and sand dunes. Nevertheless it is rich in art, culture, poetry and music. The towns of Umerkot and Tharparkar have produced famous Thari singers including Mai Bhagi, Ustad Shafi Faqir, Ustad Shadi Khan, Karim Faqir, Ustad Allah Bachayo, Rafiq Faqir and Rajab Faqir, popular folk singers in both Pakistan and India. All these vocalists are known as ‘Faqirs’ (beggars) hailing from Manganiyar family of Thar Desert. The Manganiyars provide musical services at ceremonial occasions such as births, marriages, feasts, harvests, rural fairs and at Sufi shrines. The Manganiyars, family of Mai Dhai – inhabiting Sindh and Rajasthan provinces of Pakistan and India respectively- have been gifted with melodious voices creating sweet tunes with heart-throbbing rhythm. 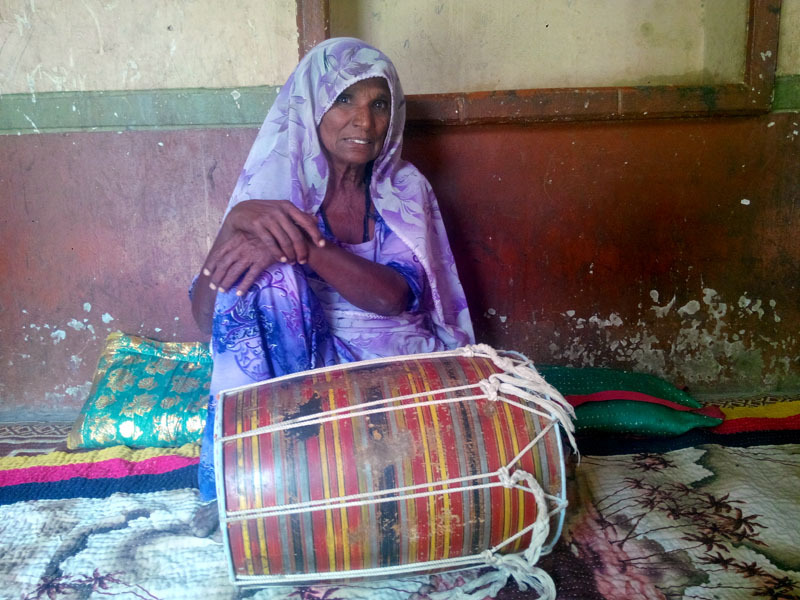 Mai Dhai used to sing traditional songs in local wedding ceremonies and festivities in the company of females earning a little amount helping her family. A popular local saying ‘Manganiyar Raoe ta be sur me’, means even if a Manganiyar cries it would be melodic. Mehnaz, a representative of Foundation of Arts, Culture and Education (FACE), told News Lens Pakistan that Mai Dhai is chosen as one of the six actors to represent Pakistan in March this year at one of the largest music festivals organized by South By South West festival (SXSW) of Austin, Texas, in US. Mai Dhai would also participating in International Day Stage and represent Pakistan at Russian House as part of SXSW festival in Austin. Visiting the US to exhibit her talent Mai Dhai said that being illiterate and a poor village lady, she had never dreamed of visiting the big city in Pakistan let alone country like America. Though, Mai Dhai has got widespread popularity, she still grazes her goats, cooks for her family and sings songs in local festivities.